Processing and tracking of maintenance activities at the United Nations is now a lot easier, thanks to Umoja! The automation of Preventive Maintenance took a leap forward after a successful deployment across Secretariat entities and, more recently, at the United Nations Office at Nairobi (UNON). 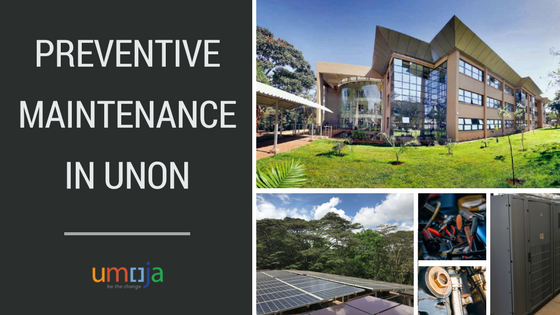 The Preventive Maintenance module was launched as part of the next wave of Umoja Extension 2 projects, to automate the manually intensive tasks involved in planned inspections and maintenance actions. Why is this important for the UN? Performing regular maintenance on major UN equipment (think air conditioning and heating units, vehicles, electrical systems, etc.) decreases downtime due to malfunction, assures optimal working conditions and conserves the life-span of the equipment. In short, Preventive Maintenance helps to ensure a safer and more efficient working environment. This latest deployment builds on the equipment records already maintained from the UNHQ Capital Master Plan, as well as equipment from the previous deployment in the Office of Central Support Services (OCSS), the United Nations Office at Geneva (UNOG), the Economic Commission for Africa (ECA), the Economic Commission for Latin America (ECLAC) and the Economic and Social Commission for Western Asia (ESCWA). Additionally, with the recent migration of peacekeeping equipment from Galileo to Umoja, Preventive Maintenance functionality will continue to expand throughout the Organization. For a closer look at the Preventive Maintenance process, download the End-to-End roadmap here.